POSTPONEMENT: The Statewide Star Party has been rescheduled for Friday April 28, 8:30 – 10 PM. 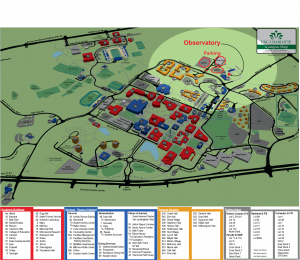 The 5th annual UNC Charlotte Statewide Star Party (part of North Carolina’s annual Statewide Star Party) will be held at the campus observatory on Friday April 21, 8:30 – 10 PM. It will be a great event for children and adults who want to learn more about the planets, stars and galaxies that make up our universe. Registration is not required, but we encourage you to register here so we can better estimate numbers for catering and contact you directly in case of postponement. 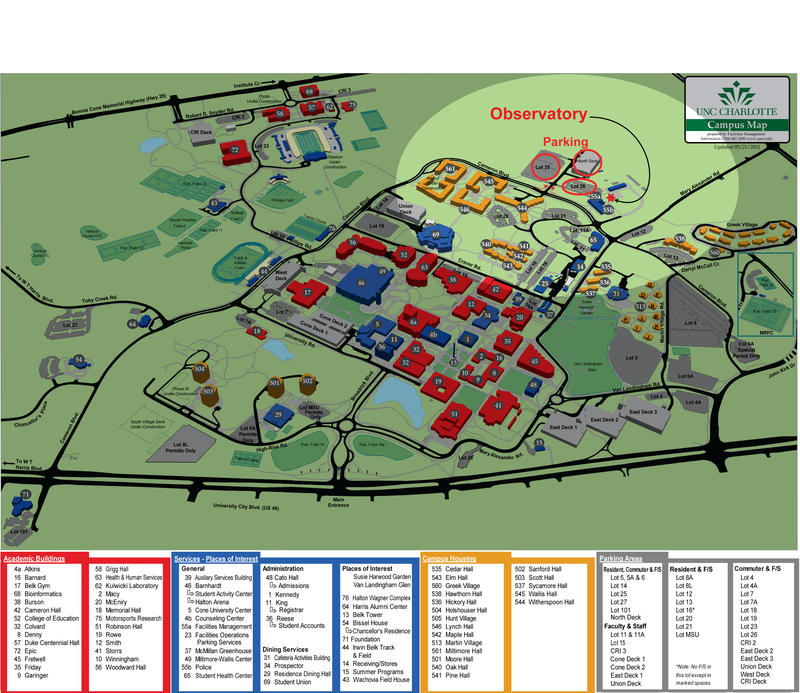 A map of campus with directions to the Observatory is shown below. Please use POPLAR LANE off Cameron Boulevard and proceed to parking in LOT 26 (closest), LOT 25, or the NORTH DECK. Parking after 7 p.m. will be free of charge. IN THE EVENT OF CLOUDY WEATHER: the event will be POSTPONED. Please check email from this account on the day of the event for updates. Updates will also be posted no later than 5p.m. Updates will also be available on the Observatory’s Facebook page at https://www.facebook.com/UNCCharlotteObservatory and on our twitter account @UNCCObservatory. Stay tuned for announcements of upcoming Star Parties and astronomy events. by following our Facebook page and Twitter account, @UNCCObservatory. You can also use the form below if you would like to be added to the Observatory email list to receive notifications about other upcoming events.